This strip is a reply to I am Maoriman, Why they became extinct - 9, Be polite!, dinosaur Grrrrrrrrrrrr..., The Race is ON! Oh, so really beautiful song ! GRATZ ! arr does he make it to the other side!? So that's why they're extinct!! Lovely scene. I like your moon! 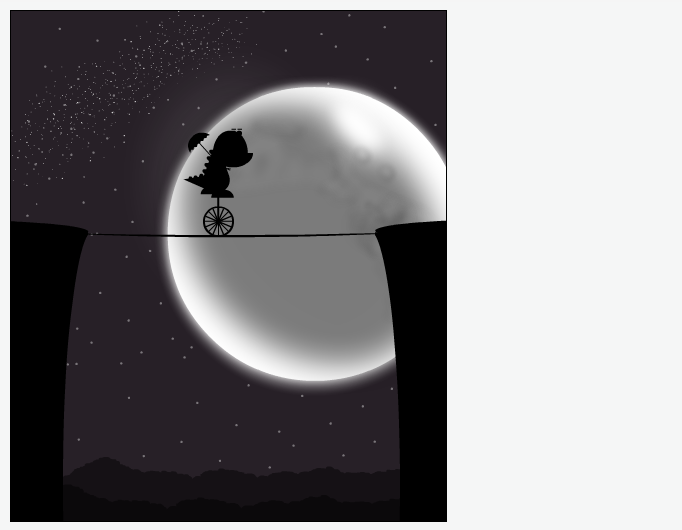 He rides a unicycle because he couldn't reach the handle bars on a bike anyway. Not with those short little arms. Wonderful! Looks great! Perfect movie poster for a movie I wish would get made! @ Maoriman: or the umbrella. Heeeeeey the wheel was around back then, was it? Vraiment tout à fait grandiose. Bravo. LOVE IT and love the music!